Please note that this webpage was originally intended to give guidance about how to improve the performance of an antenna that is similar in design to that of the Comet CHA-250. 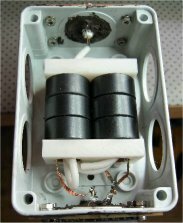 In the time since I originally wrote this webpage, I have developed a completely new type of broadband vertical antenna, the Terminated Coaxial Cage Monopole (TC2M), which does not require a tuner, is simple and cost effective to construct, and offers performance that is comparable to, or better than, other similar sized multi-band antennas. Many prototypes of the antenna have been built and tested for long periods of time, and the final optimised design has been granted a UK Patent. Full details are now available for non-commercial use. I strongly encourage you to try the new design as it provides much better performance than the antenna featured on this web page. The following notes show the design and construction of a Broadband HF Vertical antenna which does not require a tuner, and which is capable of providing moderate performance on all bands from 7MHz to 28MHz (reduced performance from 3.5MHz to 51MHz). It follows an extensive period of investigation with a Comet CHA-250 'style' antenna using a specially constructed 5:1 transformer. I tried and rejected many other designs before finally arriving at this version. The basic design and principles originally outlined on this page in 2008 have been copied by many companies (mainly in North America) without any acknowledgement of the source of the copyrighted design. They sell their products for many $100's of US dollars and continue to make outlandish claims about their performance. So if you wish to experiment and construct a fairly compact multiband antenna, that works moderately well, doesn't require a tuner and can be built for less than £20 if you shop around for parts, this may be for you. Please note that this antenna will NOT out-perform a beam antenna at 100ft on the HF bands or a 260 ft long wire on the LF bands - It works about as well as a 7m long vertical antenna can do ! I find this antenna particularly useful for HF beacon monitoring using Faros software, WSPR personal beaconing or HF ALE operation using PC ALE (most of which are free). You can compare the performance of this antenna against others, by taking a look at my transmit and receive signal reports for various bands, which have been automatically logged on the WSPR database. 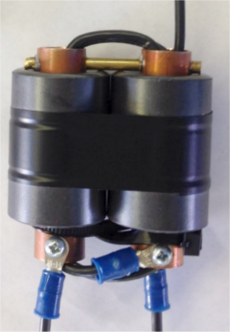 Folks considering making a G5IJ antenna (which is not what it seems as the concept is flawed, it's actually equivalent to a thick wire radiator fed via an impedance transformer, with the coax acting as a counterpoise) or those using fishing poles, 4:1 baluns and remote auto-tuners may also be interested in this design, which has minimal loss. The principle of operation is that a specific length of radiating element is chosen so that it presents an average value of impedance on most amateur bands. A special matching transformer is attached at the feed point to convert the antenna feed impedance to something close to 50 ohms. Note that all of these 'easy to match' antennas work in more or less the same way by incorporating resistive loss into the matching transformer, or by adding external resistors such as the Diamond BB7V and BB6W. Most have a low value of Shunt resistance which makes the SWR look good when a length of wire with a high feedpoint impedance (Voltage fed) is attached (1/2 wave and even multiples). This can be observed as providing a low SWR when no antenna wire is attached to the transformer. Some others also include a high value of series resistance which makes the SWR look good when a length of wire with a low feedpoint impedance (Current fed) is attached (1/4 wave and odd multiples) or an electrically short wire is used. This can be observed as providing a low SWR when the output of the transformer is shorted to the ground connection of the screen of the coax. When a good low loss transformer is used, both of the above tests should produce a very high SWR reading, as there are no transformer losses to mask the bad match (open circuit and short circuit). 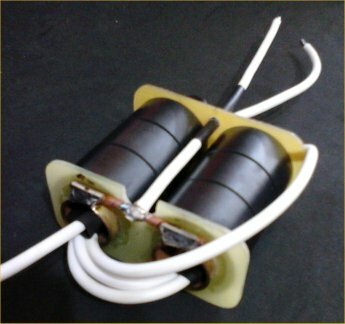 When a resistor is connected across the transformer in order to improve the match, it will absorb a lot of the applied power that would ideally be radiated. The value of the resistor will determine how much power is wasted and what the worst case SWR will be. If the transformer has a resistor that is equal in value to it's secondary impedance then it will dissipate a large amount of the applied power, but with no antenna connected the SWR will be close to 1:1. The exact amount of power that will be radiated will depend upon the antenna wire feed impedance at a particular frequency, but it is likely to radiate more power when the antenna feed impedance is lower than the the value of load resistance. If you use a resistor that is twice the value of the transformer secondary impedance then the maximum SWR with no antenna connected will be 2:1. This is usually the maximum SWR most radios can withstand without the SWR protection operating to reduce the output power to a safe level. As the value of resistance is higher than in the previous example, less power will be wasted heating up the resistor and more power will be radiated. 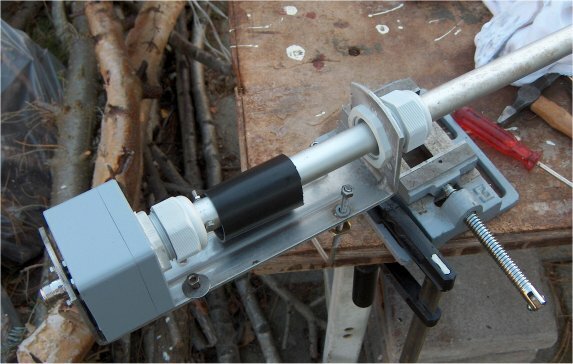 The antenna can be ground mounted or attached to an insulated pole, which will further improve the HF performance (as shown later). The graph below shows the measured VSWR of a 6.5m vertical wire antenna (supported on a 10m fishing pole) fed against 10 buried radials, and terminated with differing values of resistive loads. The Red trace is with a 50 ohm termination, Yellow with 100 ohm, Orange with 200 ohm, Green 300 ohm and Blue with 450 ohm. So the lowest overall VSWR is with a resistive termination impedance of around 200 to 300 ohms. The two markers show the 1/4 resonant frequency (M1 at 10.5MHz) and the 1/2 wave resonant frequency (M2 at 21MHz). 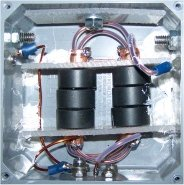 If some additional loss through the transformer and approx 2dB loss through coax cable is factored in, and the radiating element and radial system are fine tuned, it is possible to achieve a VSWR of less than 2:1 on most amateur bands. My improved transformer design still has some through loss, but it is much less than the original Comet clone. This results in several dB improvement in antenna gain compared to the Comet version (A/B measurements made with remote receiver). Graph showing loss through transformers. The Blue trace is the Comet clone and the Red trace is my improved transformer. The performance of the new transformer is much better than previous versions I have tested. I am no longer able to measure any improvement in radiated signal strength by connecting a remote tuner at the end of the low loss coax feeding the antenna (apart from 1.9MHz & 3.6 MHz where an improvement of approximately 2dB was observed). The through loss is much lower than the original version and the antenna design trades improved radiation efficiency for slightly a higher VSWR figure. However because of the reduction in through loss (and its masking effect on VSWR), the VSWR is slightly higher than that of the Comet clone. The graph above shows the VSWR measured at the base of a 6.5m high vertical supported by a 10m fishing pole. The Red trace shows the 6.5m wire fed directly. The Green trace shows a 300 ohm resistive termination, the Orange trace shows the vertical fed via a Comet style transformer, and the Blue trace shows the vertical fed via my modified version of the transformer. The two markers show the 1/4 resonant frequency (M1 at 10.5MHz) and the 1/2 wave resonant frequency (M2 at 21MHz). Note that the transformer adds a progressively greater shunt resistance at low frequencies which improves the VSWR. Further improvements in matching can be obtained by using short radials, or counterpoise wires instead of a large earth system. This increases the resistive component of the antenna impedance at the lowest frequencies. Although this reduces the antenna gain, it makes very little difference to the overall performance on the low frequency bands, as the antenna is far too short to be efficient on these frequencies anyway. These facts may horrify you, but a lot of commercial antenna manufacturers use similar techniques, they just don't tell you ! Many people would also argue that 2 or 3dB loss through a matching network is too high. But my tests suggest that even a good ATU can add between 0.5 to 1.5dB dB loss, and that many 4:1 baluns, especially those wound on iron powder cores can also add a further 1 to 3dB of loss, especially when feeding low impedance or highly reactive loads. So 2 to 3dB loss may be fairly average, and I would argue that many amateurs already have this amount of loss in their transmission path without realising it, as they have never taken the time to measure it. The chart below shows the VSWR measured via a 10m long cable at the base of the antenna. Note that any additional feeder losses will further improve the figures. For example when a typical length of coax cable (with 1 to 2 dB loss) is connected the VSWR will improve further. e.g. A 3:1 VSWR load will measure as 2.3:1 with a 1 dB cable loss and 1.9:1 with 2dB cable loss. A better indication of the performance can be obtained from the plot shown below. Note that the angle of radiation tends to become more elevated on 29MHz & 51MHz slightly reducing the useful gain. The basic components of the antenna are a 9m fishing pole, 6m support pole, home built 5:1 transformer and some wire. These are configured as shown in the diagram below. A diagram showing construction of the 5:1 transformer is shown below. Note that this is not the same as the Comet balun details of which can be found here. The ferrite rings seem to be similar to type 33material and can be obtained from CPC part number CBBR6924 or CBBR6945 Both of these are supplied in packs of five and should just slide over standard 15mm dia copper water pipe. Unfortunately some of the ferrite rings I have bought recently are slightly smaller, and so will not fit over standard size copper water pipe. If you encounter this problem you may have to buy brass tubing from a model shop instead. Here's one I made earlier ! Note - Since I originally built this antenna. Several people have tried to use it with an auto-tuner in order to improve the performance. This is not likely to make much difference, because of the losses in the transformer. If you do wish to achieve better efficiency with an auto-tuner. Then I suggest you use the 4:1 Unun wound on type 52 Iron powder material shown at the bottom of the BBV7 section of this page. 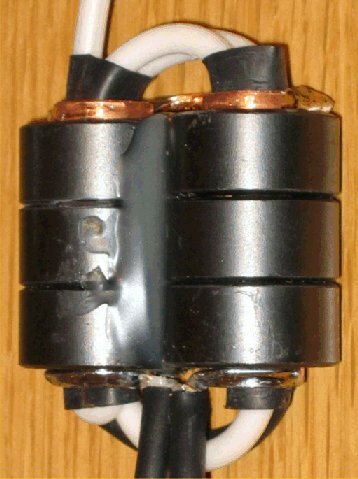 The 1:1 balun which is used to isolate the coax feed at the base of the antenna uses five of the same ferrite rings glued together with five turns of coax passed through the centre. Ideally you need at least four of these in order to achieve the best results. In summary it compares favourably with other multiband vertical antennas of similar height on the HF bands but not quite as well on the LF bands. Why can I hear stations, but they cant hear me ? You would expect that if you can hear stations you should be able to work them, however the lower noise floor on receive means that you can sometimes hear stations on the LF bands which would otherwise be masked by QRM on larger antennas. In summary the signal level is lower but the signal to noise ratio is much better. You can hear DX with it, and it seems to work very well on RX, but perhaps not quite as well on TX, which seems strange as you should expect reciprocal performance. I can measure my transmitted field strength remotely and compare the antenna against other designs and it seems to match dB for dB on TX and RX (apart from obvious absolute gain differences). Yet sometimes I call stations on the vertical and they don't come back, switch over to the other antenna and they do, even though on receive they are the same strength, it's a very odd phenomenon but I suspect it's simply down to a better receive S/N ratio on the vertical (as opposed to the absolute signal strength). I find it works well as a receive antenna on 160m and one constructor John, G4IJD, has heard a ZL station on 80m at reasonable strength. In comparisons I have found it outperforms a Datong active antenna mounted at the same height. What is the resonant frequency of the antenna ? The basis of the antenna is that it is NOT resonant on any of the desired frequencies. It is designed so that the impedance presented by the radiating element on wanted frequencies is close to the secondary impedance of the transformer for maximum energy transfer. The use of a 7.1m radiating element is not accidental (the radiating element is actually a ¼ wavelength long at 10.4MHz). Its intended to present a manageable impedance on the desired amateur bands, whilst not being too long (under 5/8 wave) for effective operation on 10m and 6m. Making the vertical element longer would cause the angle of radiation to increase in elevation, reducing the useful gain. How can I further improve its performance ? The main problem is balancing the parameters of maximum vertical length (which needs to be kept below 5/8 wave at the highest frequency), sufficient length to be efficient at the lowest frequency, a moderate feed impedance (to suit the transformer ratio) for the radiating element at all frequencies required for TX, and ideally some horizontal component to keep the folks who require NVIS performance on 80m happy. You could replace the transformer with an auto-tuner, increase the number and length of radials, increase the height of the support pole, use lower loss coax, increase the transmit power, add an 80m long offset top loading wire. The permutations are endless - but its not the antenna you started with ! How can I make it work better on the LF bands ? Performance on 80m is a bit of a compromise. I think its about 6dB down on an equivalent length radiating element and counterpoise, but with an auto-atu in place of the transformer. Feeding the transformer with a remote atu made about 2dB improvement on 80m over the transformer alone. On the HF bands adding a remote atu made very little difference. However the perceived lack of performance may be due to several factors. One is that its a lot shorter than a ¼ wavelength on the LF bands, another is that being a vertical it has very little upward radiation, so it is a poor performer for NVIS coverage on 1.9 and 3.6MHz. Hence once you get outside the ground wave coverage there is nothing until past about 500 Miles so its very poor for semi-local contacts. The main difficulty is managing the impedance presented by the radiating element on the LF bands. For example a 7m long wire over an average ground plane on 1.9MHz is typically 10  J1310 and on 3.6MHz 10.5 J640. As you can see the resistive element is very small in relation to the transformer secondary impedance and the reactive component is very much greater and capacitive. With my transformer design I have tried to roll off the impedance ratio at the LF end to get a closer match to the radiating element but its still a long way out. From this I hope you can get a good feel for what design parameters can be traded, and those which will remain a compromise. The ideal efficient broadband antenna is a holy grail for antenna designers, and Im sure there are a lot more qualified persons than myself who havent found it yet. John, G4IJD suggested using the antenna in a horizontal configuration. I have been playing with this idea, and the best configuration so far seems to be something like an 11.2m horizontal wire at 10m above ground, with the transformer also at 10m, fed with coax and with the 1:1 choke balun fitted to the coax at 2m above ground. However I suspect that the mechanical difficulties of supporting the transformer at 10m may make an inverted L easier to implement. To achieve this all that's required is the addition of a horizontal wire at the top of the existing vertical section.This would add an NVIS component, increase the radiation resistance and improve the efficiency on 80m. The question is, how long should the horizontal wire section be. I suggest keeping the vertical section the same length as the original design, but add a horizontal wire of length 12.2m or 27.2m long, to make the total length of radiating element either 19.2m or 34.2m. These lengths should not present an impedance of much greater than 1K on any of the desired transmit frequencies.You can use the LVD programme on this website to give an estimation of feed impedance if you wish to experiment with other lengths (also see my notes relating to auto-tuners). Using a 12.2m horizontal top wire will add a useful NVIS component on 3.6MHz, but you really need to get upto 27.2m long before it becomes effective. However at this point the antenna is starting to become fairly large. Another option would be to use two top (or more) wires of differing lengths say a ratio of 1/3 & 2/3 in order to provide mismatched currents which would result in better NVIS coverage. One other idea I have tried, is to add a helical winding at the top of the vertical element in order to improve performance on the LF bands without adversely affecting the HF bands. 400 turns of close spaced wire 2m down from the top of the radiating elment with about another 0.5m of wire above it works well for 160m and also provides some improvement on 80m. 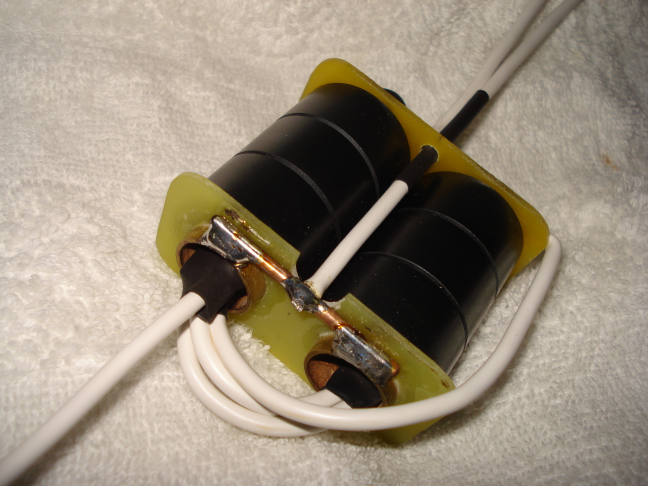 Another alternative would be to try using the transformer to feed something like a 60m dia horizontal loop, which would also improve NVIS coverage on the LF bands. How can I make it work better on 6m ? Performance on 6m is reduced beacuse of the length of radiating element. Ideally a vertical antenna should not be longer than 5/8 wavelength, or most of the radiated energy tends to fire up towards the sky. I have tried modeling the antenna with a four element capacity hat at various heights, and have found that four 1m long radials attached to the main vertical radiating element 2m above the feed point, results in approximately 6dB more gain towards the horizon. There is still some energy radiated up towards the sky, but this is more than offset by the improvement in gain at low angles. This modification does result in a slight reduction in gain on 10m, but this may be a worthwhile trade. So far I have not had the opportunity to try this, but hope to do so in the near future. Could I use some other form of loading ? There is a problem in adding any form of loading as it introduces varying impedances at other frequencies. A loading coil or trap which is introduced to improve performance on the LF bands will have an impact at the HF end. The least problematic method would be to add a loading coil towards the top of the radiating element and / or capacitive loading. A technique such as Petlowany loading is also a possibility, see my washing line antenna. >>>Having first established that my effort came close to your results ( base of antenna still at about 3m agl) my "gut" feeling was that T (or maybe capacity since T is really out of the question) loading would improve the match on top band and 80m without significantly altering the loading on the HF bands. For test purposes I have attached 4 wires, all equal in length to the main element, to the top of the antenna.By bringing these wires out from the base I can see any effect on the matching quite easily. Using all four wires extended out to about 5m from the base at 90 degrees to each other, the VSWR on top band drops to about 1.4:1 when measured at the transmitter and so an ATU is not required. Matching on all other bands can then be taken care of by an ATU. To return everything to normal I simply connect all wires together at the base of the main element.Haven't tried all combinations yet but will keep you posted. I have no idea what effect this has on the radiation pattern but in my situation the extra wires double up as guy wires and stabilise the antenna in high winds thus boosting neighbour confidence. Of course all this is possible because the base is easily accessible from a ladder. More analysis of this is required, but it struck me that the wires could be brought bact to the base of the radiating element to form a cage folded monopole, perhaps something like this. Some broadband military HF antennas use this technique, often in conjunction with a high power terminating resistor. Why did you use coax cable as the radiating element ? When I modelled the antenna I found I got better results using a larger diameter conductor. I reduced the diameter until the results started worsen. The best compromise was to use a diameter of around 10mm, and coax cable was the cheapest option. If you have aluminium tube or an old CB antenna this would be better still. Just cut the length so that it is a ¼ wave at 10.4MHz as this will give the correct matching impedance at other frequencies. If you need to use a shorter support pole it is possible to use a lazy helical winding for the radiating element, say up to 4 turns per metre length it should be OK, however this technique tends to introduce unpredictable secondary resonances which could put lumps and bumps into the frequency response. How critical is the height of the mounting pole and the length and number of radials ? They are not too critical, for example, three 5m long radials would be fine, however I would suggest that all the radials or counterpoise wires and the mounting pole are not connected to ground and the length does not exceed 10m. You may wish to experiment with the lengths and angle of dangle to achieve the best impedance match on the required frequencies. On the LF bands longer radials would be better but you could try adding say two inductively loaded radials tuned on the LF bands of interest. As I previously stated you can mount it higher or lower within certain limits. But if this is not easy you could consider ground mounting with at least four radials. In this case adding more radials will further improve the performance. I have obtained very good results by mounting this antenna on top of a building with a metal clad roof. I did not use any radials, but mounted the transfomer close to the edge of the roof and connected it to the cladding with a short metal strap. 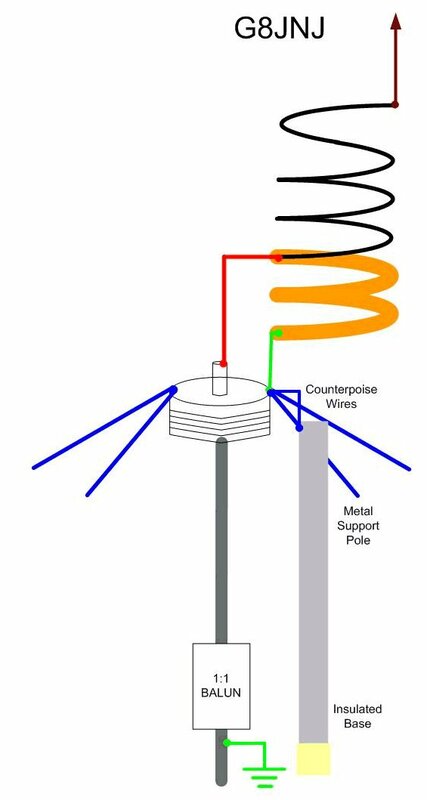 If either of these two methods are not possible, you can ground mount the antenna and connect it to as many radials as possible. However the gain will be significantly lower than using an elevated feed and counterpoise / radials. Why is there a 1:1 choke balun at the base of the mast ? The purpose of this is twofold. 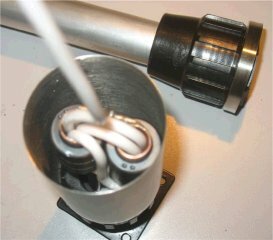 It is designed to provide a high impedance break in the feed cable at a specific point so that the vertical section of the coax (and the support pole it runs along) is lifted above ground to form a counterpoise, the whole antenna then becomes similar to an off-centre fed vertical dipole. If the balun was fitted at the top of the pole, there would still be coupling between the outer of the coax below the balun and the support pole. The second purpose is to prevent electrical noise and other unwanted interfering signals which may be carried on the outer of the coax from being conducted into the receive path. It also eliminates RF on the coax when used for transmit purposes. Please note that simply using coiled coax as a balun does not provide a high enough choking impedance for this purpose. 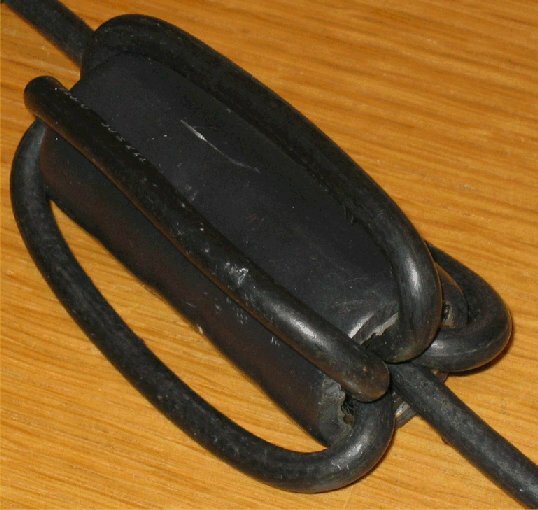 Can I use chokes from CRT monitor cables or some others I have in my junk box ? I have tried a large selection of ferrite materials, including some which I have recovered from scrap CRT PC monitors. There is a very large variation between types (even those from the same make and model) I think they just use whatever they can get hold of. 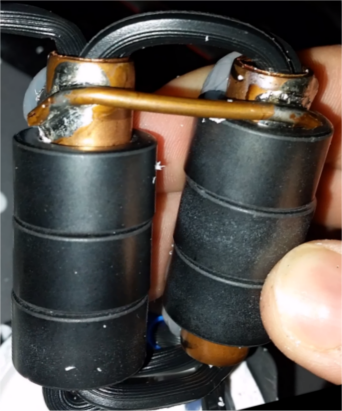 If you have a large number (at least 10 and ideally 30 - 40 or more for 1.9 & 3.6MHz) and thread them over coax they can be used for the 1:1 balun to suppress noise which would otherwise be induced on to the received signal. However the variation in characteristics makes them difficult to use for the transformer, if you wish to obtain repeatable results. Also be very careful about ring cores you buy at radio rallies or on e-bay. Many of these are actually made from iron powder, and are designed for low frequency (əMHz) use in switched mode power supplies. They are not suitable in this application. If you have an impedance measuring bridge you can test them to see if they are made of ferrite. As a rule of thumb with one turn you should obtain about 2.5uH at 2MHz, 1uH at 10MHz and 0.4uH at 30MHz for a 20 x 30mm core with 7mm dia hole if it is similar to type 43 material. However if you do this I cannot guarantee it will work as well as a transformer made with the specified parts. Do I have to use copper or brass tube ? No, Wolfgang, OE1MWW has successfully used braid from RG213 coax. He also tried using just a single wire loop, but found that the closer coupling provided by the coaxial tube winding produced much better results. See further down the page. How can I increase the power handling ? The main problem with power handling seems to be at frequencies around 18 to 22MHz where the length of radiating element is around ½ wavelength which presents a high load impedance. 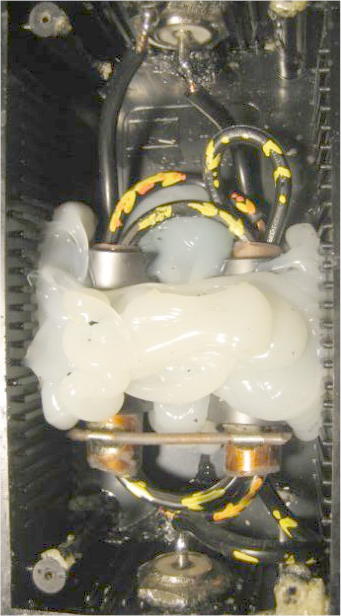 This results in power being dissipated in the ferrite material used in the transformer core. Using a metal box and heatsink and bonding the ferrite material to the box with thermally conductive epoxy resin may help. More cores can be added, but this will lower the frequency at which the maximum impedance transformation occurs, which may increase loss on the LF bands. Another suggestion is that the ferrite cores are replaced with powdered iron and the quantity increased. 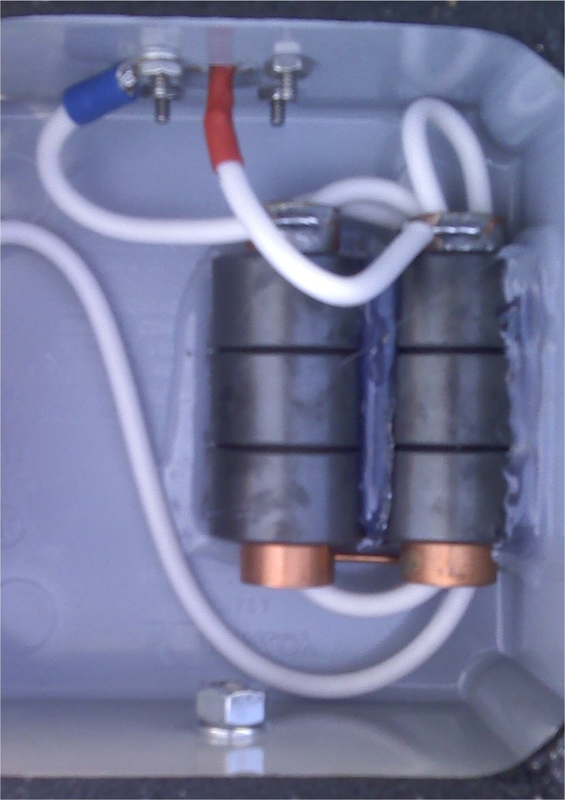 You may need to use 20 or more powdered iron cores to achieve the required inductance. The input impedance with no radiating element connected should measure at least 200 ohms at the lowest operating frequency. Why did you use the inner from coax cable for the transformer secondary winding ? I picked this for its high voltage insulation properties. Most foam insulated satellite TV coax has a breakdown voltage of around 1.8KV. This should be adequate for power levels up to about 200watts on frequencies where the radiating element presents the highest impedance (and requires maximum feed voltage ) to the transformer. Who else has made one ? despite the fact that my original design artwork was clearly marked © G8JNJ 2008, several companies have copied and sold key parts of this design without crediting the source. 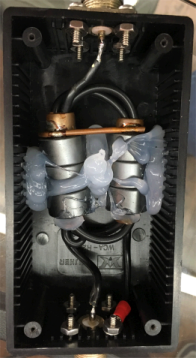 I'll let you guess who they are, as the manufacturer of one of the four shown below threatened to sue me for putting a photo showing the inside of "their" matching unit on my website ! At least these guy's are a bit more open, but still no credit to the source. In early 2016 a video entitled "Inside of an Alpha Match" was posted on YouTube by user "steinhest" showing the inside of a matching unit as sold by Alpha Antenna. "Wow!! They're now using what we've been using in our HYBRID, HYBRID-MINI and EMCOMM II for years!!!! It's a 5:1 UNUN!! 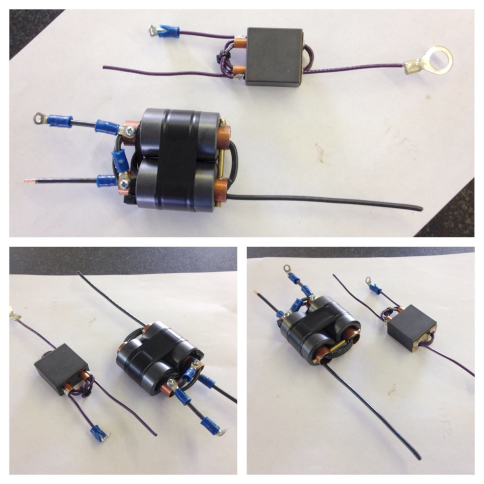 LOL﻿"
"This is the pictures of our 5:1 transformers. The larger one is used in the HYBRID, HYBRID-MINI, EMCOMM II, TD, TD Lite and the WINDOM 40 and the small one is used in the HYBRID-MICRO. With any of the above mentioned antennas and with a proper installation this is the type of performances that can be possible to achieve with them. Our transformers are made in a way to reduce the losses to a minimum." Here's a more detailed view of the larger transformer. Here's another video that has been posted on Youtube. This one shows the inside of both an Alpha and Cameleon matching unit. They look very familiar don't they ? Note that both Chameleon and Alpha Antenna get consistently good reviews on Eham http://www.eham.net/reviews/ so why not try building one yourself.